HomeAll VideosMoving 3 times is as bad as a fire! Funny dachshund dog video! In spite of the fact that there is still a lot of work at our new apartment, we decided that the time have come… We spent all week collecting and packing all our stuff to not forget anything! And today… We are moving! We decided that in our new apartment we will start a new life! But it seems to me that the Universe took it too literally! I hope you enjoy my funny dachshund dog video! Just 5 minutes more! Funny dachshund dog video! Air Dachshund – The Parkour Dog! Funny animal video! How could you do that!!! 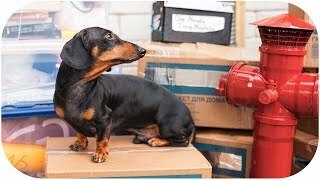 Cute and funny dachshund dog video! DOG takes a BATH! Funny animal video! Are you ducklings? 0_о Funny dachshund dog video! After taking revenge you can buy better things than the stuff you lost. What a bad bad men for steeling your things. Din, your hydrant and your humans are safe – This is what really matters!!! I love your episodes! Greetings from Brazil. Молодец,что не доверил свой любимый пожарный кран.хоть что то у Дина осталось,а остальное прикупите. That was brilliant!!!!! Din, your ma and pa are so funny as are you too!!!! Love you guys!!!! Wadahell dat thief ,, well at least they didnt get his hydrant. …no friggn way man. He got your time machine. It would have been the most useful item. You have your humans and the fire hydrant. Life is blessed. I love every one of your videos Doxie. You are so smart and funny. I wish my dachshunds were as funny and smart. Lo más importante es estar con doxie din. Te propongo que por estas fechas seas "coco din"
Such a great helper Din! !